America’s corporate tax rate was uncompetitive and created distortions in the economy that prevented companies from investing in the U.S. The Tax Cuts and Jobs Act of 2017 was designed to level the playing field and in the process, create all sorts of high-paying jobs. The Federal corporate tax rate was slashed from 35% to 21%. Yet, like all good things, it eventually ended. 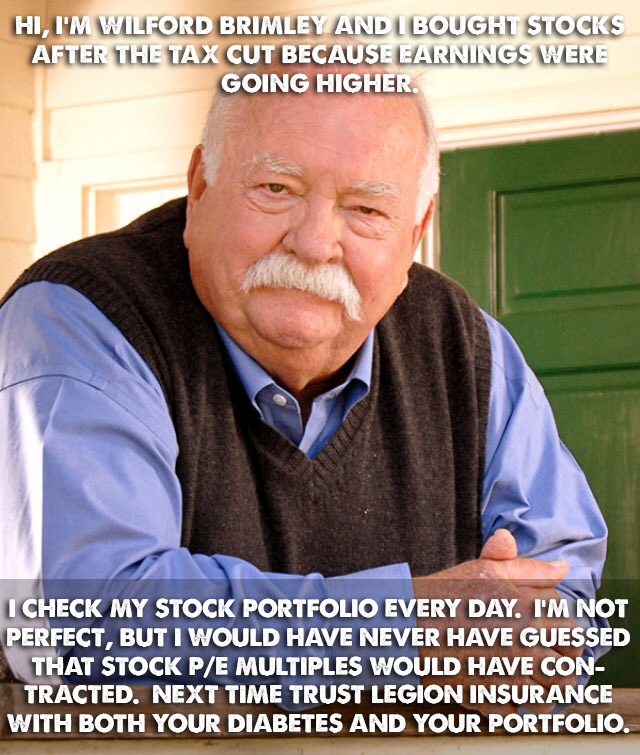 Over the past couple of months, stocks have been slipping. But what caused the euphoria to break? 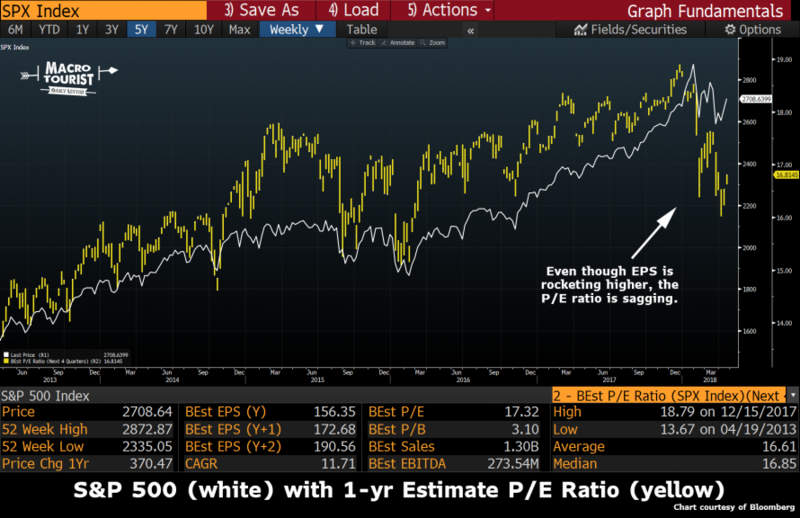 Even though earnings estimates are still ratcheting higher, the price-to-earnings multiple has been sinking. The 1-yr forward P/E multiple was almost 19 in the days before the tax cut announcement. That same measure is now sitting below 17. 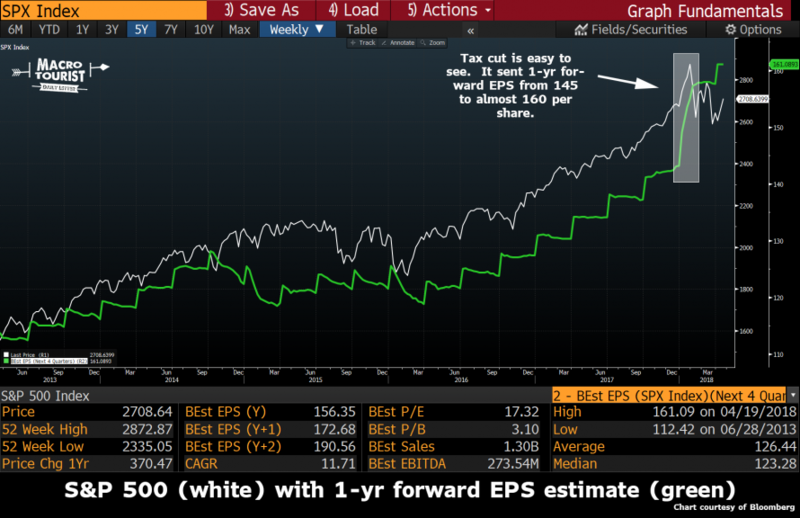 Investors are now taking sober second-looks and re-examining the appropriate multiple to pay for post tax-cut earnings. We are now almost 9 years into this economic expansion. This cycle is getting long in the tooth. It’s probably not the time to forecast aggressive future growth and pay peak multiples for stocks. The economic bulls will claim the tax cuts will keep this economic upswing fueled for a while yet. And maybe they are right. Who knows? Yet, I think they might be making a mistake about the tax cut effects. There can be no denying that the tax cuts will unleash a lot of extra capital. Yet we need to ask ourselves what will happen to that money. There are three main possibilities. The first, and most beneficial for the economy - companies invest that capital back into their business through CAPEX spending. This would be the best case scenario. The result would be more productive companies, increased jobs, and a stronger economy. Yet ever since the Great Financial Crisis, interest rates have been hovering near zero. For many businesses capital has been almost free. Why would the tax cuts suddenly cause them to invest in the CAPEX they have delayed for so long? Now don’t mistake this as a forecast that there will be zero pickup in CAPEX spending. Of course some of the tax cut will go into CAPEX spending, but not nearly as much as the economic bulls would have you believe. The second option is that companies share the tax windfall with their employees. Although there were some announcements from companies announcing bonuses or wage increases, a lot of these were PR promotions. According to Paul Tudor Jones’ organization Just Capital, most of these announcements were one-time bonuses. Many companies have already made clear their intentions to prioritize shareholders. CEOs from Coca-Cola, Cisco, Amgen, and others have stated that the extra money will largely flow to the investment community through increasing dividends and stock buybacks. According to an S&P Dow Jones survey conducted in July of 302 companies surveyed, 65 percent said they planned to boost dividend payments, and 46 percent forecast share buybacks. Yup. The tax-savings will flow back into the stock market in the form of buybacks and dividends. There is no sense arguing about whether this is right or wrong, good or bad. It is what it is. Arguing about it is like arguing with the wind. But it has dramatic ramifications about financial market prices going forward. Assuming there will be increased buybacks with less CAPEX spending than expected, it is safe to conclude that the real economy will underperform. After all, we have decades of data showing that trickle-down is not nearly as effective as advocates believe. Not only that, its marginal effect is also decreasing. Yet even though buy-backs will not kick-start the real economy, it will have an effect on the financial economy. We can expect stocks to be goosed higher in the coming quarters as the buy-backs kick in. Many projections have buy-backs increasing by over 75% this year. This is from an already elevated level. The relentless bid from corporates purchasing their own shares will not be going away anytime soon and, in fact, will increase in intensity in the coming months. And this is a problem. Think about the dilemma the Federal Reserve is facing. They are raising rates, but can’t tighten financial conditions. 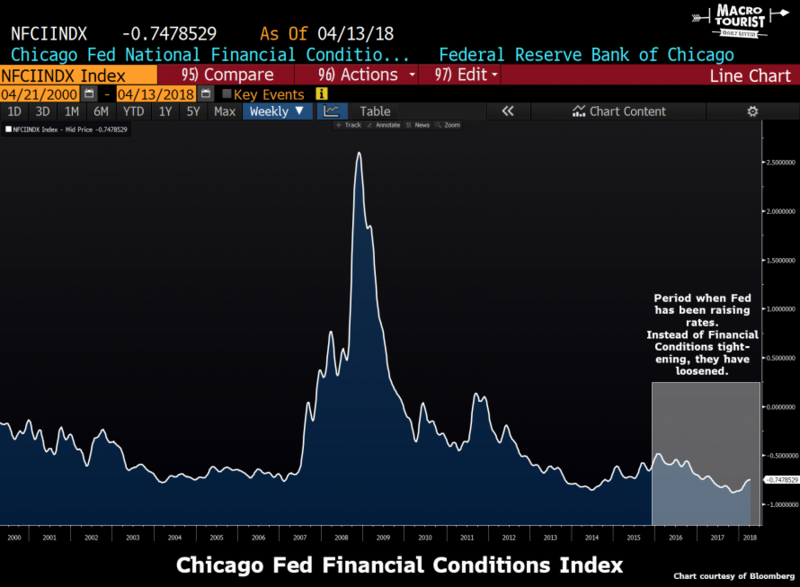 This buy-back development only mutes the Federal Reserve’s effectiveness at influencing financial conditions as stocks and other credit spreads will be bid. Therefore, at the margin, this means the Federal Reserve will mistakenly believe they need to raise rates even more. So even though there is little real economic growth from the tax-cut, the Federal Reserve will tighten so that they can create a slowdown in financial market appreciation. It’s the worst of both worlds - little actual real growth which is squashed by a central bank worried about overly easy financial market conditions. This combination will only hasten the economic slowdown. No wonder stock market investors are reluctant to pay peak P/E multiples. In the coming quarters, there will be a struggle between corporate buy-backs and investors who correctly realize the economic cycle is approaching completion which will be made all the worse by a central bank who cannot tighten financial conditions without dramatic action. One last chance to sell? All I can say is don’t hold out for peak P/E multiples. They probably hit their high right before the tax cut. The market will be a lot less optimistic about future growth. It’s a delicate dance between how much EPS can grow in the meantime before the economy finally rolls over. Colour me skeptical that growth will exceed expectations. This last round of corporate tax-cut fueled buy-backs might be the best chance to write some sweet pink tickets.